The Luxurious Mushroom Garden for You. "Mushroom Garden" accomplishes new evolution. The log becomes very important in this “Mushroom Garden Deluxe”. Rare Funghi will sprout on the log with higher level. Happy surprise might happen wen you clear the request from Cromwell. Gold, Silver, and Bronze medals holds the key to advance the Library. Library change depending on collected number of Funghi. Participate in the events and get the seasonal items! The first event is planned in August. Music makes cultivation mucu more fun!! All new 6 music were installed. These were created by Toshiko Tasaki, the sound-creator of Touch Detective. 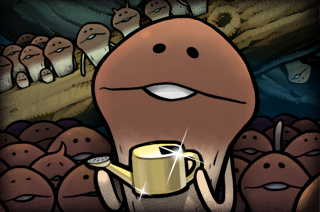 The world’s first “genuine mushroom-growing simulation” game. It was first released as a Spin-off app of the adventure game "Touch Detective" in 2011. Cultivate and harvest the Funghi by single finger.